Huawei Technologies (Bangladesh) Ltd. and Magnito Digital signed an agreement at a ceremony recently held in Dhaka. 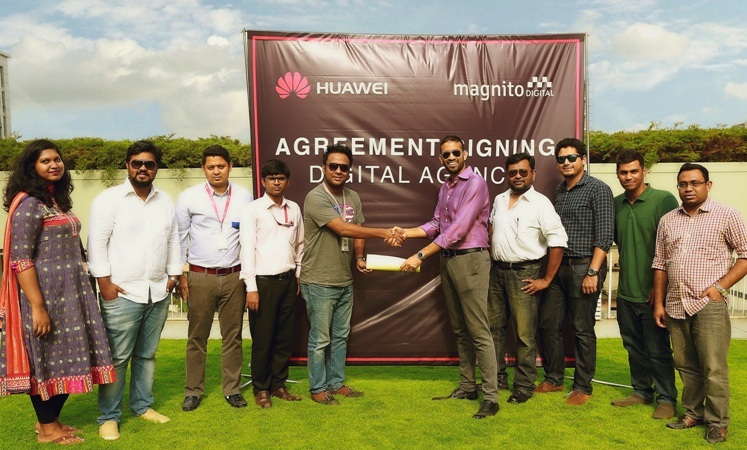 Under the agreement, Magnito Digital has been appointed as the digital agency of Huawei Technologies (Bangladesh) Ltd. and will manage the digital assets of Huawei Mobile Bangladesh. Huawei is one of the leading Smartphone manufacturers in the world, with a good footprint in Bangladesh. Magnito Digital is one of the leading digital agencies of the country. Mashrur Hassan Mim, Head of Marketing, Huawei Device Business Department, Md. Monjurul Kabir, Assistant Marketing Manager, Suman Saha, PR Manager were present from Huawei Bangladesh, whilst from Magnito Digital, Riyad Husain, CEO, Khawar Saud Ahmed, COO, Arif Rahman, Account Director and Kaushik De, Creative Director were present among other at the signing ceremony held in Gulshan.